Flowerbed edging separates the garden from your yard to help protect plants and flowers from encroaching grass and from damage caused by lawn mowers and weed trimmers. Conversely, it also stops these plants from spreading into the grass if they are particularly vigorous breeds. But what are the best flowerbed edging options and what should you know if you choose to DIY this project? Read on and find out. Whether flowerbed edging is made of formal brick or more casual stone, landscape design benefits from a carefully thought-out edging plan. For a more formal design, use straight edges and geometric shapes formed from standard materials such as recycled brick. For an informal garden, consider flexible plastic edging or materials that can be laid in short increments to be formed into a shape like sweeping curves. Edging can be either unobtrusive and blend seamlessly into the landscape and seem to disappear, or it can be very visible and as decorative as any other part of the garden. There is actually a wider variety of edging materials than you might realize. Popular types include metal, iron fencing, plastic fencing, pre-cast stone edging, flexible plastic, recycled brick, pavers, polished decorative stones, garden pebbles, landscape stones, cedar mulch, crushed stone, river and field stone, landscape timbers, and even railroad ties. Your choice will largely depend on personal aesthetic, but also the size of the flowerbed itself. And you aren’t limited to this list, either! The possibilities for edging are only limited to your own creativity. For example, you can use recycled wine bottles for an eclectic look that costs almost nothing. Coming up with your own edging can be intimidating because no one wants to put time and money into a project only to have it fail spectacularly. But we’re here for you, with a few ideas to get you started. Using oyster-shaped, polished stones can achieve an interesting monochromatic, contrast to a colorful flowerbed. These fill spaces more evenly than round stones and provide an even, pleasing color. Tropical gardens may be edged with eco-friendly bamboo or other natural materials. This is a very environmentally-friendly option that looks exotic and elegant. Create a country garden design with laminated plastic or white-painted metal fencing edging with finials and other decorative designs. Take inspiration from a classic English garden and use formal brick edging. This type of design works well with a crisp, clean garden with a lot of traditional flowers like rosebushes. Or, go Southwest-style with strategically placed natural stone boulders. Copy the style of a golf course with deeply-trenched edging, and flowerbeds filled with several inches of mulch. 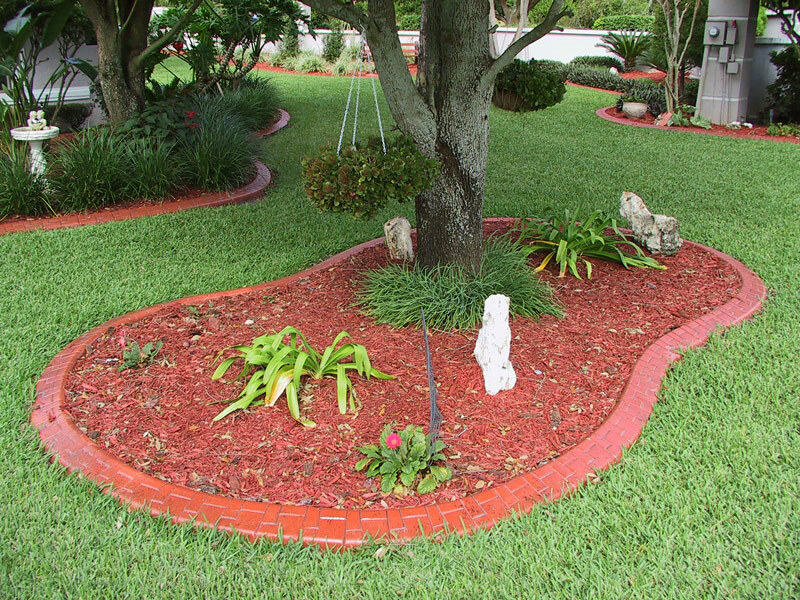 As for the mulch itself, try different colors to accent or complement the rest of the landscape design. 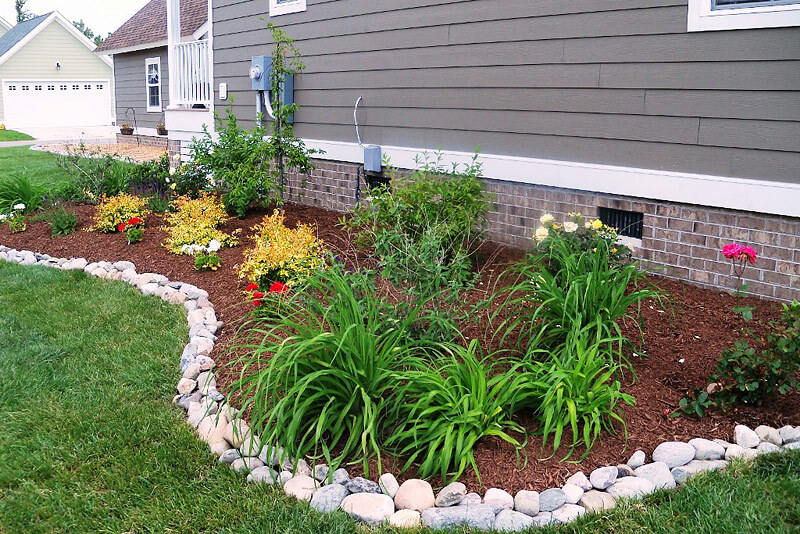 There are mulches in brown, red, gray, and black, and the colors are resistant to fading for many months. Whichever flower bed edging materials you select, it’s important to lay out the design on the ground before proceeding to tackle the final product. Use chalk, landscape tape, string, or spray paint to clearly define the area. Then, do a dry run—lay out the stones, bricks, or edging material and double-check the design to ensure it’s appropriate. If you’re satisfied with your design, it’s time to lay it out for real. Call your local utilities office before you dig anywhere in your yard to avoid potential problems. Once you’re clear, dig the trench or compact the earth where your edging will be, depending on the material used and instructions. Set in the flowerbed edging materials. Then, take a moment before putting the materials in place to check for proper drainage. If you skip this step, your edging will suffer for it down the line.